Blink... It's Faster Than You Think! 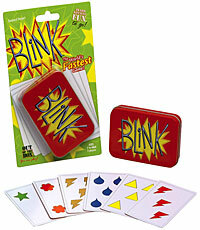 BlinkÂ® is the lightning fast game where two players race to be the first to play all of their cards. Using sharp eyes and fast hands, players quickly try to match the shape, count, or color on the cards. The first player out of cards wins! Blink is a real-time game, which there are not so many of. The title refers to what you should not do, if you wish to win the game - it plays that fast! Obviously you should stay away if you suffer from analysis paralysis, but for anyone else, this is a fast and fun game that you should not miss. I use it as an opening game for game night, where it works a great icebreaker.